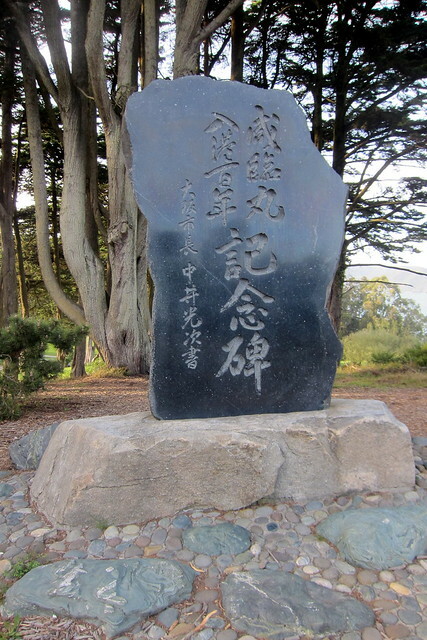 At Land’s End promontory within Lincoln Park is a Japanese Monument or Kanrin Maru Monument http://farm8.staticflickr.com/7207/6969697479_1d0bf83476_z.jpg that was dedicated in 1960 as a monument of friendship between the Japanese and American people replacing the animosity and hostility during World War II. USS San Francisco was a U.S. Navy heavy cruiser (CA-38) launched in 1933 that saw extensive action in World War II in the Pacific. At the Battle of Guadalcanal in 1942 she lost 106 men including Rear Admiral Daniel Callaghan. Decommissioned in 1946, a portion of the shell-pocked flag bridge is encased as a monument at Land’s End in Lincoln Park overlooking the Pacific Ocean. http://www.flickr.com/photos/wallyg/6823405620/ The ship’s bell from the USS San Francisco is on view in the lobby of the Marines Memorial Club & Hotel at 609 Sutter Street off Union Square in downtown San Francisco. San Francisco Musem and Historical Society located at The Old Mint 785 Market Street, is undergoing a restoration to become San Francisco Museum at the Mint http://www.sanfranciscomuseum.org/ The National Historic Landmark San Francisco Mint (1874 designed in classical revival style by Alfred B. Mullett) is the centerpiece of the project. It survived the 1906 earthquake and fire. The goal is a LEED Platinum certification restored and refitted building. Art Cycle 2013 by the Texas Tech Museum is actually a recycle event in which people are invited to donate their no longer treasured treasures, dropping them off at the Museum back [east] door March 21, 22, 28 or 29 from 3:00 – 5:00 p.m. after which they will be sorted priced and prepared for display April 11 – 14 and sold at very low prices to become treasures of someone else. The place for display and sale will be a booth at the annual Lubbock Arts Festival in the Lubbock Memorial Civic Center Exhibit Hall April 11 – 14. The proceeds benefit the Museum Association and through it Museum events and activities. Donations and purchases are for a good cause and some folks feel relieved when their undisplayed treasures are appreciated and displayed by their new owners. Recycling works as a win-win activity, leading to its popularity. Aristotle was really ahead of his time. He said “the aim of art is to represent not the outward appearance of things, but their inward significance”. An art appreciation class could be taught with that remark as the opening ambit, and a short discussion and display of images would suffice to make the point. A computer digitized resource for looking up Texas history is The Portal to Texas History at University of North Texas Libraries www.texashistory.unt.edu It is accessible to the public without charge. He and the tribe were sent first to Fort Leavenworth Kansas as prisoners and then to Indian Territory [Oklahoma] where few survived, and those were then split and led to reservation land near Kooskia Idaho while Chief Joseph and others were led to the Colville Reservation in Washington State in the grand coulee area of north central Washington State in Okanogan County. He pleaded repeatedly to be allowed to return to the Wallowa Mountains area but the federal government refused. His grave in 1904 was a cairn of rocks in a cemetery at Nespelem Washington. Eventually a concrete monument would be erected at the site. http://www.findagrave.com/cgi-bin/fg.cgi?page=pv&GRid=3502&PIpi=3190508 In the year before his death he visited Seattle and made a speech in an auditorium that went into the history books but persuaded no one in attendance. Curtis photographed him again in his studio as he had earlier on the Colville Reservation. Curtis said Joseph “was one of the greatest men that has ever lived”. In his honor a hydroelectric dam on the Columbia River is named Chief Joseph Dam http://www.nws.usace.army.mil/Missions/CivilWorks/LocksandDams/ChiefJosephDam.aspx ; other sites are Chief Joseph Scenic Byway http://www.yellowstonecountry.org/things-to-do/scenic-byways/chief-joseph-scenic-byway/ , Chief Joseph Pass http://www.allmissoula.com/scenic_drives/chief_joseph_pass.php , Joseph Canyon http://www.waymarking.com/waymarks/WM2CRG_Joseph_Canyon_Viewpoint , the town of Joseph Oregon http://josephoregon.org/ , and Joseph Creek http://www.americanwhitewater.org/content/River/detail/id/4298/ . Richard L. Rashke, Escape From Sobibor (Avon Books 1982, 1987) Texas Tech Southwest Collection Special Collection Libraries 62.65 R224 E74 (1987) is currently available on Kindle at Amazon.com for $2.99. It tells the story in 390 pages of a Nazi death camp for Jews in Poland from which 600 inmates attempted an escape, 300 successfully, on October 14, 1943. There are six other items on Sobibor at Lubbock Public Library and nine at Texas Tech Library. Many people enjoyed the annual bus tours on a Saturday in September of historic ranches and historic event sites conducted by the historical commissions of Hockley and Cochran counties. The full day event with lunch dinner and entertainment was well worth the cost of around $75. Entry onto private ranches and other properties was secured by the tour operators so this was a unique opportunity. John Hope, chair of the Hockley County Historical Commission, reports that no tour will be conducted in 2013. He did say that some folks are suggesting that ranches and historic sites in the rolling plains counties to the east might be good candidates for touring. A one evening film festival of short pieces related to literary writings, will be held Friday April 5, 2013 at Texas Tech University English Building Lecture Hall 001 (basement) from 7:00 – 9:00 p.m. $25 admission and gourmet popcorn and sodas will be served. Included will be original short films, video essays, stories, and cinematic poetry. The sponsor of this event is Iron Horse Literary Review www.ironhorsereview.com and more information is available by e-mail at ihlr.mail@gmail.com or phone 806-432-2385 speaking to Leslie Jill Patterson, a student and probably an English major at Texas Tech University. Texas Tech students from foreign countries get together each year to cook their favorite dishes and supply them for your pleasure at the International Food Festival 6:00 – 8:00 p.m. at Frazier Alumni Pavilion on campus southwest of the football stadium. The date is Sunday March 24. Buy tickets $1 each and sample dishes around the hall. If you haven’t eaten Brazilian or Nepalese [e.g. ], this is your chance. When we say something is supported by The Meadows Foundation in Dallas http://mfi.org/ we sometimes don’t know who started that foundation. Algur (Al) H. Meadows, was born on April 24, 1899, in Vidalia, Georgia, to John M. and Sally Marie Elora (Daily) Meadows. In 1915, he graduated from Vidalia Collegiate Institute and later attended Georgia and Alabama Business College and Mercer University. After leaving Mercer to travel the south, Al worked with Standard Oil Company in Shreveport, Louisiana, from 1921 to 1929 and concurrently earned a law degree from Centenary College. During this time, he married Virginia Stuart Garrison, with whom he had one son. By 1936, he founded the General Finance Company and the General American Oil Company. Located in Dallas, Texas, the oil company expanded throughout fifteen states, Canada, and Spain. While working in Spain, he acquired numerous paintings by artists such as El Greco and Goya. During 1948, Al and Virginia established the Meadows Foundation to perpetuate their joy of giving to others. Today, the Foundation has generously benefited numerous Texas organizations and institutions. Upon Virginia’s death in 1961, he donated their art collection and a million-dollar endowment to Southern Methodist University to establish a museum of Spanish art. Al served on numerous boards of directors and as a member of many professional, civic, and social organizations. Al passed away June 10, 1978.